I started reading mysteries when I was a very young child. Having gone through all of the library’s Nancy Drew’s and Trixie Belden’s, I would sneak over to the adult side and revel in the wonderful detective writers they had over there, including Agatha Christie, Erle Stanley Gardner and my favorite, Ellery Queen. I know he’s old fashioned, but I learned much of my adult vocabulary from his writing (“There was not a scintilla of evidence…”) and his mysteries almost always included a formal “Challenge to the Reader” to solve the mystery that I was eager to accept. 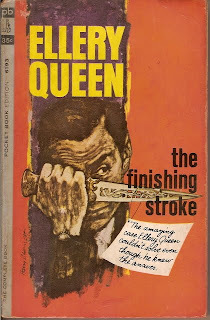 Among my favorite titles from the pen of Ellery Queen is The Finishing Stroke, a brilliant and complicated mystery set during the 12 days of Christmas in an old mansion in upstate New York in the middle of a raging blizzard. Ellery has been invited to spend the holidays, along with 12 other guests, at the home of Arthur B. Craig, a wealthy publisher. Other guests include Ellery’s friend John Sebastian, his cousin, Ellen Craig, his fiancé, Rusty Brown and her somewhat eccentric mother, Mrs. Brown, who is deeply into astrology, John’s friends Marius Carlo and Valentina Warren, Dr. Sam Dark, the family physician, Roland Payne, the family attorney, Dan Z. Freeman, publisher and the Reverend Mr. Gardiner, an Episcopal priest. And thus the scene is set for a happy holiday gathering – or not. On the first evening a present is found under the Christmas tree. The small, wrapped box contains a carved ox, an unfinished doll’s house, and a tiny camel. The accompanying card reads “On the first night of Christmas your true love sends to you, a sandalwood ox in a holiday box, An unfinished house for the soon-to-be-spouse, A grey and white camel with skin of enamel.” Not exactly threatening, but anonymous and mysterious nonetheless. Ellery, who has a reputation for being somewhat of a sleuth, is asked to look into the matter and the game’s afoot. Because the card is based on the song The Twelve Days of Christmas, no one is surprised when the puzzling gifts keep on appearing. And then Santa and a dead body turn up. The solution is a bit esoteric, but really clever and the atmosphere of the holidays and the snow and the isolation make for a perfect winter holiday mystery.